Nine species of Malus are recorded in Britain. These include one native species, Crab Apple (M. sylvestris). Apple (M. pumila) is introduced. Malus domestica is treated as Malus pumila by Stace (2010). Forty-three British miners are recorded on Malus. A key to the European miners recorded on Malus is provided in Bladmineerders van Europa. 1a > Leaf-miner: Initially a linear mine which later develops into a conspicuous blotch; frass in two rows in linear section, scattered irregularly in the blotch. 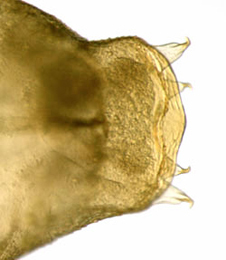 Larval mandibles with two teeth (Spencer, 1976). Corridor, gradually and considerably widening towards the end. Frass in two rows in the corridor part, further up dispersed irregularly. Pupation outside the mine (Bladmineerders van Europa). A short broad upper surface corridor leading to a long blotch between veins (British leafminers). On Agrimonia, Filipendula, Fragaria, Geum, Potentilla, Rubus and Sanguisorba, but not yet on Malus, in Britain. On additional Rosaceae elsewhere. Common and widespread throughout Britain. Also recorded in the Republic of Ireland, Europe, Japan, U.S.A. and Canada. Agromyza idaeiana (Hardy, 1853) [Diptera: Agromyzidae]. 1b > Leaf-miner: Mine irregularly linear, even forming secondary blotch. Pupation in mine (Spencer, 1972b: 93 (fig. 315). Phytomyza heringiana Hendel, 1922 [Diptera: Agromyzidae]. 2b > Leaf-miner and case-bearer: The larva initially makes a blotch mine in the leaf, which it then excises to form its case. The larva overwinters in its case before resuming feeding in spring. A new case, 6-7 mm long, is then constructed from a further blotch mine (UKMoths). The second case is indistinguishable from C. spinella and C.prunifoliae (British leafminers). The final case is a tubular leaf case, 6-7 mm long, light brown at first, darker later. The rear end is trivalved, the mouth opening is around 45°. The larvae live at the underside of the leaves, and make sizable full depth mines (Bladmineerders van Europa). On Carpinus, Corylus, Quercus and Salix, but not yet on Malus, in Britain and Betula, Carpinus, Corylus, Fagus, Quercus, Malus, Prunus, Pyrus, Sorbus and Salix elsewhere. Widespread though not common in Britain. Widespread in continental Europe. On Betula, Agrimonia, Crataegus, Filipendula ulmaria, Fragaria vesca, Geum, Helianthemum nummularium, Potentilla, Prunus spinosa, Rosa, Rubus caesius, Rosa fruticosus and Salix cinerea, but not yet on Malus, in Britain plus Malus sylvestris, Ribes, Sanguisorba and Spiraea elsewhere. Widespread in Britain and in continental Europe. On Alnus, Betula, Corylus, Ulmus and Sorbus, but not yet on Malus, in Britain plus Carpinus, Mespilus, Ostrya, Hippophae, Ribes, Myrica, Forsythia, Amelanchier, Chaenomeles, Cotoneaster, Crataegus, Cydonia, Eriobotrya, Malus, Prunus, Sorbus, Spiraea, Populus and Salix elsewhere. This is probably the commonest species of British coleophorid, and is found throughout the British Isles. Widespread in continental Europe. Polyphagous. On numerous genera and species in several plant families, including Malus, in Britain and elsewhere. Widespread in Britain and continental Europe. 3a > Leaf-miner: The larvae create a distinctive blotch mine in the leaves of apple (Malus). The larva cuts an exit hole on the underside of the leaf, which distuingishes the mine from that of Ectoedemia atricollis (UKMoths). Egg either at upperside or underside of the leaf, close to the leaf margin. The mine begins as a narrow corridor which is strongly contorted, unless it lies close to the leaf margin. The corridor abruptly widens into an elongate blotch, that often runs over the initial corridor. The frass is brown; it almost fills the initial corridor; in the blotch it is concentrated in its first section. Pupation external; exit slit invariably in the lower epidermis. In Ectoedemia atricollis, of which the mine bears some resemblance to the one of pulverosella the exit slit is in the upper epidermis; moreover, atricollis is much later in the year (Bladmineerders van Europa). The gallery leads to large brownish blotch (British leafminers). On Malus in Britain and elsewhere. Fairly well distributed in the British Isles. Also recorded from Ireland. Widespread in continental Europe. Bohemannia pulverosella (Stainton, 1849) [Lepidoptera: Nepticulidae]. 3c > Leaf-miner: The young larvae mine the leaves, causing a gallery followed by a semi-translucent blotch on the upper surface of the leaf. It then vacates this and folds the edge of a leaf down to feed within, usually twice, before pupating externally among detritus (UKMoths). The mine begins as an inconspicuous epidermal corridor, mainly recognisable by its reddish brown frass line. In the next instar a blotch is formed. The mine not starting over a vein, rather lies between two veins. The colour initially is silvery, but soon the mine gets a characteristic onrange-brown tinge. Usually, but by no means invariably, the mine is upper-surface; lower-surface mines keep their original silvery colour. Silk is deposited witihin the mine, but in little quantities and the mine contracts only lightly. The mine hardly contains any frass. After some time the larva leaves the mine and then lives free in a leaf margin that has been folded downwards and fixed with silk. Two such folds are usually made, and eaten out to the upper epidermis (Bladmineerders van Europa). Polyphagous. 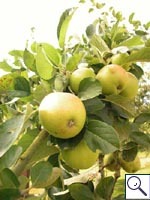 On numerous genera and species of several plant families, including Malus, in Britain. On numerous genera and species of several plant families, but not Malus elsewhere. Widespread in Britain and continental Europe. Also recorded from the Channel Is. 3e > Leaf-miner: The larvae form galleries along the edge of the leaf, leading to the development of large blotches on the leaf margin (UKMoths). Oviposition on the leaf underside. There begins a full depth corridor that gradually widens into an irregular elliptic blotch. Generally the corridor part for a large stretch follows the leaf margin. 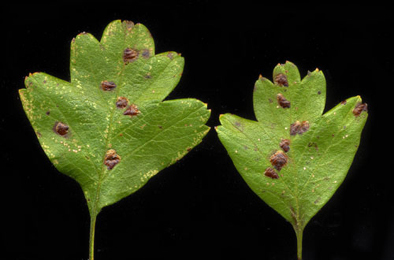 If oviposition occurred well away from the leaf margin, the corridor starts by making some irregular loops around the oviposition site; however, when, as often occurs, the egg is placed close to the leaf margin, at once the leaf margin is mined. Frass blackish brown (rarely brown) in the corridor, black in the blotch. In the corridor the frass lies in lumps or indistinct coils; in the blotch the frass is irregularly dispersed. Pupation outside the mine; exit slit in the upper epidermis, contrary to Bohemannia pulverosella, with which atricollis may co-occur on Apple (Bladmineerders van Europa). 3f > Leaf-miner: Oviposition by way of an ovipositor, no egg visible therefore. 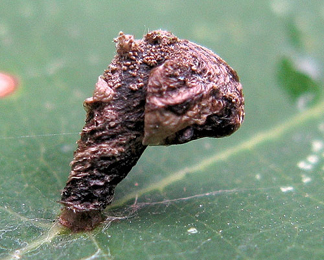 The larva makes an irregular blotch. The part of the mine nearest to the oviposition site is more thranslucent than the later, in transparancy more greenish, part of the mine. The mine usually lies close to the leaf tip, often several together. 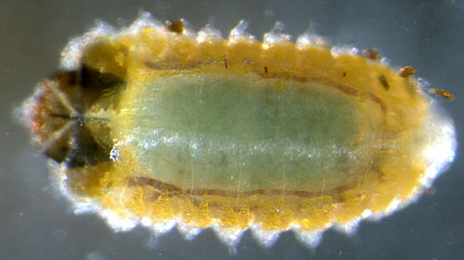 After its first moult the larva makes a roundish excision, 3-4 mm in diameter. 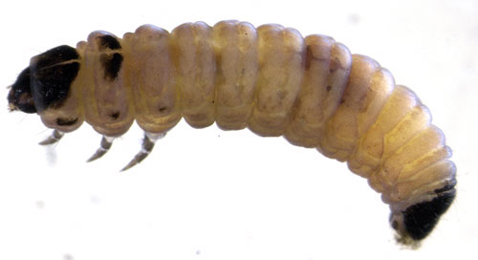 Incurvaria larvae, while resting, take a horse-shoe like posture, unlike the larvae of Antispila species. Sandwiched herein it drops to the ground and continues feeding of dead leaves. The excision occupies about half of the surface of the blotch (Bladmineerders van Europa). The mine is also described in (UKMoths). On Vaccinium myrtillus, Prunus and Rubus chamaemorus, but not yet on Malus, in Britain. On several genera and species of several plant families, including Malus, elsewhere. Widespread in much of the British Isles and continental Europe. 3g > Leaf-miner: The larva starts making a corridor of a few mm, followed, and mostly overrun, by a circular blotch of 4-5 mm diameter (Bladmineerders van Europa). Generally several larvae feed in a single leaf, creating a distinctive pattern of feeding windows. The larvae then cut out circular cases and drop to the leaf-litter to continue feeding, leaving behind a leaf containing many circular or oval cut-outs (UKMoths). 3h > Leaf-miner: A circular or oval brownish blotch with a central spiral of dense blackish frass (British leafminers), sometimes several mines in one leaf (UKMoths). Oviposition is at the leaf underside, well away from the leaf margin; the egg has a fine reticulate surface. The mine is a rather large, perfectly circular blotch without a trace of a preceding corridor. Around the dark centre the frass, glued to the upper epidermis is arranged in distinct arcs (Bladmineerders van Europa). Pupation in a silken cocoon, usually on detritus (British leafminers). Polyphagous. On numerous genera and species in several plant families, including Malus, in Britain and elsewhere. Widespread in Britain and continental Europe. Also recorded in the Republic of Ireland. 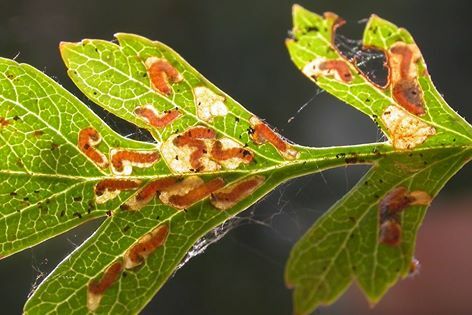 3j > Leaf-miner: The larva mines the leaves of various roseaceous trees, such as blackthorn and apple, forming a gallery leading to a blotch (UKMoths). Eggs are deposited in the underside of a leaf, well away from the margin, often several per leaf. Around the oviposition site a cavity develops that in the end often leaves a hole in the leaf. Then a narrow, hardly widening, winding corridor, largely filled with a broad reddish brown frass line. The corridor abruptly widens into a wide, full depth blotch, that often lies against the leaf margin. The larva may leave its mine and continue elsewere, even on a different leaf. Note that the first blotch may already lie on a different leaf. Frass dispersed, in oval granules. Most frass is ejected through semicircular cuts along the outer limit of the blotch; part of it is often trapped in strands of silk under the leaf (Bladmineerders van Europa). The pupal cocoon is suspended from silken 'guy ropes' and closely resembles that of L. clerkella (UKMoths). 3k > Leaf-miner: Early mine a blotch with lower and upper epidermis turning brown. Then either a fold at the leaf edge, or a mine resembling that of a Phyllonorycter, but formed by a silken pad on the underside (British leafminers). The mine begins with a lower-surface epidermal corridor, but soon the larva starts feeding on the sponge parenchyma. The mine then becomes a flat lower-surface blotch. Silk, deposited in the mine causes the lower epidermis to pucker ligtly. The lower (later also the upper) epidermis of the mine is greyish brown to brown. After leaving the mine the larva lives freely under a folded leaf margin, or in a fold at the underside of the leaf, in its centre, that is covered with silk (Bladmineerders van Europa). 3l > Leaf-miner: A mine with several creases in lower epidermis. On thinner leaves, such as crab-apple, the upper surface may be arched to form a tube (British leafminers). Lower surface tentiform mine with a yellow-green epidermis that has a few folds. Pupation within the mine. The pupa is amber or chestnut brown, and lies in a white cocoon. Generally the frass is accumulated in a corner of the mine, but sometimes a small quantity is incorporated in the wall of the cocoon (Bladmineerders van Europa). 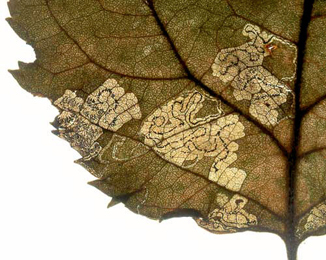 3m > Leaf-miner: The mine is in the upper epidermis of a leaf, usually over midrib or vein. The mine is at first silvery, later with brown speckling (British leafminers). Silvery, upper-surface, epidermal tentiform mine, centered over the midrib or a heavy lateral vein. Unlike P. leucographella, with which this species shares some host plants, the upper epidermis looks dirty by the presence of numerous fine black-brown specks of frass. The epidermis remains without folds until the mine becomes strongly contrated. Young mines look like a streak of silver on top of a vein (Bladmineerders van Europa). 3n > Leaf-miner: The mine is an underside, strongly creased blister, causing a distinct pucker in the upperside of the leaf (UKMoths). Elongated, lower surface, tentiform mine with one strong fold in the lower epidermis. Pupa in a white cocoon, in which no frass in incorporated; all frass in a clump in the mine. Before ecdysis the pupa works itself out of the mine through the floor in the mine (Bladmineerders van Europa). Difficult to distinguish between P. cydoniella and P. blancardella on the basis of mine characteristics - both form arched tubes on the leaf of M. sylvestris. P. cydoniella tends to make the larger mine on M. sylvestris and the pupa is in a cocoon, with frass to one side (British leafminers). On Pyrus and Sorbus, but not yet on Malus, in Britain and Amelanchier, Cotoneaster, Cydonia, Malus, Mespilus, Prunus and Sorbus elsehwere. Recorded in East Kent, Hereford, Hunts, Surrey and Worcester in Britain. Also recorded in the Republic of Ireland. Widespread in continental Europe. On Chaenomeles, Prunus and Sorbus, but not yet on Malus, in Britain and Cotoneaster, Crataegus, Cydonia, Malus, Prunus, Pyrus and Sorbus. Widespread in Britain, Ireland and continental Europe. 3u > Leaf-mine: The young larvae make very small (≤ 3 mm) corridor or blotch mines, usually several in a leaf. The primary mine generally lies adjacent to the midrib; as far as I have seen the egg always is upper-surface. The secondary mines often are found in leaves without primary mine: obviously the larvae easily move to another leaf. The secondary mines are made from the underside of the leaf; while moving around silk is deposited under the leaf. Most frass is ejected from the mines, and part of the frass grains remain stuck in the spinning. Rather soon the larvae start living completely free in a common spinning under a leaf. They hibernate in a hibernaculum and continue living free in the spring (Bladmineerders van Europa). 3v > Leaf-miner: Egg either at upperside or underside of the leaf. The mine begins as a narrow cooridor, often following a vein or the leaf margin. Later sections of the corridor are mch wider and contorted, mostly forming a secondary blotch. Frass in a narrow central line, sometimes a bit broader towards then end of the mine. Often several mines a a leaf (Bladmineerders van Europa). 3w > Leaf-miner: The mines are found between veins. The initial gallery is narrow and then forms an orange-brown blotch (British leafminers). Egg at the underside of the leaf. The mine is a small compact corridor, rather strongly widening towards the end, mostly in a vein axil. Colour of the mine often orange. Frass in a broad, irregular central line (Bladmineerders van Europa). On Malus in Britain and elsewhere. Widespread in Britain and continental Europe. Stigmella incognitella (Herrich-Schäffer, 1855) [Lepidoptera: Nepticulidae]. 3x > Leaf-miner: A long thin linear gallery with frass in a thin line, sometimes broken. This distinguishes it form S.nylandriella, which never has linear frass throughout the mine. The gallery of S.magadalenae is also narrower than S.nylandriella. S. magdalenae can both be an edge miner or make a small mine in the leaf blade, or run along a vein (British leafminers). Egg at the underside of the leaf, independent of the venation. The corridor is narrow from start to end, and compressed on a small space, sometimes following the leaf margin for a while, more often along a major vein. Frass in a narrow, regularly interrupted central line. In thick leaves the frass line is broader, and the corridor is shorter (Bladmineerders van Europa). On Sorbus, but not yet on Malus, in Britain and Amelanchier, Cotoneaster, Malus and Sorbus. Widespread in England, Wales, Scotland and Northern Ireland. Also recorded in the Republic of Ireland. Widespread in continental Europe. 3y > Leaf-miner: The gallery is sinuous, widening later, with linear frass (British leafminers). Egg at the underside of the leaf, near a vein. The mine is quite variable. It is a rather strongly tortuous corriodor, sometime widening only a little, sometimes strongly, at times ending in a secondary blotch. Frass black or brown, in a narrow central line (Bladmineerders van Europa). On Malus in Britain and Malus and Prunus elsewhere. Widespread in Britain and continental Europe. Also recorded in the Republic of Ireland. On Prunus, but not yet on Malus, in Britain and Malus and Prunus elsewhere. Widespread in Britain, Ireland and continental Europe. 3zb > Leaf-miner: A narrow gallery leads abruptly to large blotch (British leafminers). Oviposition on the leaf underside. The mine begins as a very slender winding corridor of 15-20 mm, the second part of which is almost stuffed with frass. The corridor abruptly widens into a blotch with dispersed frass; in large leaves this blotch is almost circular. Mostly the midrib is not crossed, but the mine can occupy the major part of a leaflet. Often several mines in leaf (Bladmineerders van Europa). On Sorbus, but not yet on Malus, in Britain and Amelanchier, Cotoneaster, Malus and Sorbus elsewhere. Widespread in Britain. Also recorded in the Republic of Ireland. Widespread in continental Europe. 3xc > Leaf-miner: Full depth blotch, invariably beginning at the leaf tip or the tip of a leaf lobe or tooth. Oviposition site covered by a black, shining drop of hardened secretion. Frass generally in long threads, but sometimes in elongated granules. Pupation in the mine, not in a cocoon (Bladmineerders van Europa). On Corylus avellana, but not yet on Malus, in Britain. On several genera and species in several plant families including Malus elsewhere. Widespread in Britain and continental Europe. 3xd > Leaf miner. The egg is deposited in the base of the midrib. After oviposition the female severes the petiole, causing the petiole to break. The leaf start to wilt and falls, but still remains green for a considerable time. The larva tunnels in the midrib, and makes from there broad, full deep blotches in the lamina. Frass dispersed in the mine. Often several larvae in a leaf. Pupation in the ground. Blommers & Vaal (2002a) and Gønget (2003a) describe the biology in more detail. (Bladmineerders van Europa). On Crataegus, Mespilus and Prunus, but not yet on Malus, in Britain and Amelanchier, Cotoneaster, Crataegus, Cydonia, Malus, Prunus and Pyrus elsewhere. Recorded in several counties in southern Britain and widespread in continental Europe.